Can you help me prepare my article for publication? Scribendi can provide the professional editing needed to improve your work and get it ready for publication. Our expert editors will eliminate typos, ensure grammatical correctness, and smooth out the writing so that it is clear and expressive. We will make the required revisions to ensure consistency throughout the document, and we will apply the style guide of your choice, including specific journal guidelines, to your citations and references. Our editors will also provide critical commentary, pointing out where issues remain, where arguments are flawed or incomplete, and where improvements can be made. You’ve done the hard work, and you don’t want your work to be rejected because it lacked a final polish. Have Scribendi shine up your work for submission. I need help with making sure this conforms to a specific style guide (APA 6th Edition, MLA, Turabian, Chicago Manual of Style, etc.). No problem. Just tell us what style guide we should refer to when you place your order, and our editor will ensure that the style guidelines are applied consistently throughout your document. The style guidelines are typically applied to the citations and references. If you want them applied to other elements, such as the headings, figures, and structure, please make sure to let the editor know that you want these elements revised when you place your order. Visit our Academic or Student page for a complete list of available services. I submitted an MS Word file, and I have my document back, but I can't see what you've changed. Why is this? It may be that you have the "Show Markup" feature turned off. If you are using MS Word 2010, 2013, or 2016, click on the Review tab. In the section named "Tracking," there are three drop-down menus—they're to the right of the button named "Tracked Changes." Click on the top one. Choose All Markup. Then, click the Show Markup menu to make sure all the markup options are checked, including "Insertions and Deletions." If you are using Word 2007/Office XP, click on the tab named Review. In the section named "Tracking," there are three drop-down menus—they're to the right of the button named "Balloons." Click on the top one. Choose Final Showing Markup. If you still don't see any changes, please feel free to contact us or get in touch via Chat. What style guides do you work with? We can apply any style guide to your work. The most popular style guides are the American Psychological Association (APA), Modern Language Association (MLA), Turabian, Chicago Manual of Style, Harvard Referencing, and Council of Science Editors (CSE). We can also apply a journal’s style guide (just send us the details) or a corporate/internal style guide. I’m submitting to a specific academic journal. Can you apply this journal’s style guidelines to my article? Yes, we can certainly apply your target journal’s style guidelines to your article. Please provide us with the name of the target journal when you place your order. If possible, please provide a link to the specific style guidelines: simply copy the URL for the journal’s guidelines and paste it into your client notes when you place your order. 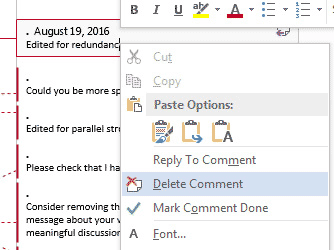 I submitted an MS Word file, and now I have all your revisions and suggestions highlighted in red. How do I include these changes quickly? For MS Word files (.doc and .docx), we use the Track Changes and the Comments features. You can access the Track Changes and Comments tools by clicking on the Review tab. You can use the tools on the Review tab to Accept or Reject changes one by one, or you can Accept or Reject the changes all at once. 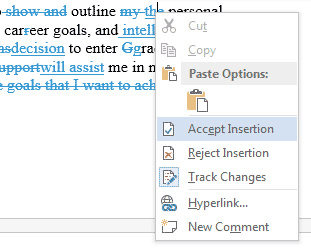 You can also right-click on individual changes in the document to access the Accept/Reject functions. You can also delete the comments with the Review tab. Right-clicking on a comment balloon also brings up a Delete Comment function in the fly-out menu. How do I get a word count for my document? 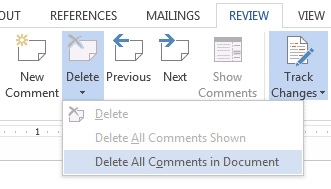 In MS Word, go to the Review tab or Tools menu and select Word Count. If you're doing a word count for an academic paper, be sure to check the option to include footnotes and endnotes in the word count. You can also use the Scribendi Word Count Tool. Simply copy and paste your text into the Word Count Tool, and it will provide the word count of the document. Please note: We do try to double-check word counts on the documents that we receive, but to ensure that there are no delays in processing your order, please make every effort to give us an accurate count. If there is a section that you do not want us to check, please mention this in the "Special Instructions" field of the order form. Can you check my calculations? Your editor can ensure the consistent formatting of formulas and can revise the language that introduces such formulas and calculations to ensure that the work is presented clearly, but unfortunately reviewing the correctness of the actual formulas is beyond the scope of the service. If there is any uncertainty about your calculations, they should be checked by top experts and peers in your chosen field. At this point, our language experts can then revise your writing to ensure clarity and precision of expression throughout to ensure that your results are properly communicated and can be published to contribute to the topical literature. My target journal requires proof that the paper has been professionally edited. Can you provide this proof? If you’ve had an order completed by Scribendi, the Scribendi invoice can be used as proof of editing, as it has been designed to provide the necessary information for proof of editing. However, if you require something more specific, we can provide you with a certificate indicating that your work has been edited by Scribendi. Just contact us and let us know what you require; one of our Customer Relationship Specialists will be happy to help you.